Chicago Public Schools do not keep pace with the rest of the state in serving students with disabilities. Although some areas of the state have made great progress, Illinois significantly lags behind other states in the implementation of progressive policies and fiscal resources that ensure the true integration of individuals with disabilities into their communities. This report highlights key areas where Illinois' programs and policies require more serious attention: community living, education and youth transition, and employment. The report provides problem statements, illustrative statistics, goals and recommendations for each of these topics. Within each of the key topics, a target date of 2015 has been set for the implementation or achievement of the proposed goals. This date coincides with the 40th anniversary of the federal Individuals with Disabilities Education Act and the 25th anniversary of the Americans with Disabilities Act, two vital pieces of legislation in the disability rights movement. 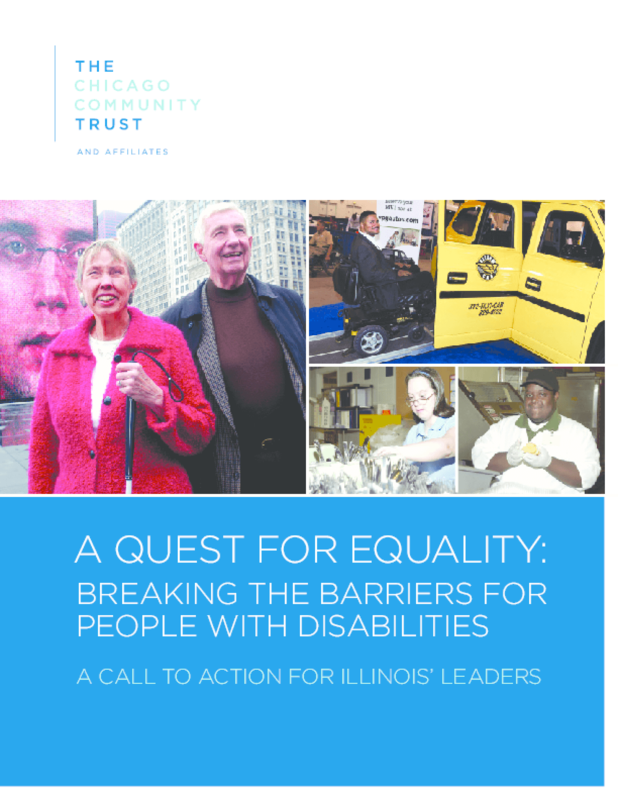 To uphold the promise of these important laws, this report discusses issues that are key to improving the quality of life for Illinoisans with disabilities. Copyright 2010 the Chicago Community Trust. All rights reserved.